The Feelfree Day Tour is our top selling paddle for recreational touring with Sit On Top Kayaks, General Purpose Kayaks and Touring Kayaks. The Day Tour paddle has asymmetrical blades for increased paddling efficiency and reduced torque. Available in two different material specifications: Standard and Deluxe. We cannot currently offer delivery outside Pembrokeshire for our paddles. You are welcome to pick up from us in North Pembrokeshire. Please email: Shop@Kayak-King.com to order your new toy. This high angle paddle is best fit for day touring. 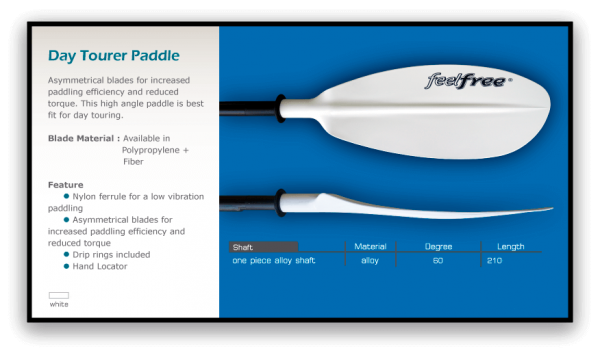 Asymmetrical paddle blades for increased paddling efficiency and reduced torque. A great paddle for touring the coast, lakes or rivers. We use these daily for our tours along the Pembrokeshire coast as they are strong durable yet light enough to be used all day long.